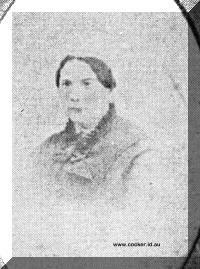 4-Lillias Cross Murray was born on 19 Apr 1816 in Edinburgh, Midlothian, Scotland, was christened on 8 May 1816 in St Cuthberts Church, Edingburgh, Scotland, and died on 1 Dec 1896 in Armadale, Victoria at age 80. Jane Carmichael Strachan was born on 20 Jun 1839 in Hobart Town, Van Diemen's Land and died on 6 Oct 1913 in Melbourne, Victoria at age 74. Jane married Robert Murray-Smith, son of Alexander Smith and Sophia Sherbourne Murray, in 1858 in Victoria. Robert was born in 1831 and died on 31 Aug 1921 in Toorak, Victoria at age 90. They had four children: Lillias, Robert Sherborne, Mabel and Estelle. 6-Lillias Murray-Smith was born on 29 Sep 1861 in South Yarra, Victoria. Lillias married Colonel Hedley Hunt Calvert, son of John Calvert and Jane Murray. Hedley was born on 25 May 1859 in Geelong, Victoria and died on 12 Feb 1937 in Foscomby Hall, Ashleworth, Gloucestershire, England at age 77. They had two children: Hedley Murray and Mabel Lillias Jean. 7-Hedley Murray Calvert was born on 18 Jun 1886 in Holts, Newent, Gloucestshire, England and died on 17 Sep 1962 in Foscomby Hall, Ashleworth, Gloucestershire, England at age 76. Hedley served in World War I, first with the Royal Gloucestershire Hussars, in France, and later as an English Officer with the Australian Imperial Forces, 4th. Australian Artillery. Hedley married Muriel Dasiy Bruce Price, daughter of Alan Cameron Bruce Price J. P. They had three children: Lorraine Murray, Martin Wyndham Hedley and Mabel Lillias. 8-Lorraine Murray Calvert was born on 26 Jul 1920. Lorraine married Reverend Donald Allan Lachlan Maclean, son of Reverend Alan Macintosh Maclean and Unknown, on 14 Jan 1950. 8-Martin Wyndham Hedley Calvert was born on 11 Nov 1922 in London, England and died in 1970 at age 48. 8-Mabel Lillias Calvert died on 12 Mar 1941. Mabel married Major Charles Andrew Hamilton Palairet, son of Charles Harvey Palairet and Emily Henry, on 22 Sep 1915 in Ashelworth, Gloucester, England. Charles was born in 1877 in Berkley, Gloucestershire, England and died on 13 Mar 1941 in Ledbury, Hereforshire, England at age 64. They had three children: John, Lillias and Charles. 7-Mabel Lillias Jean Calvert died on 12 Mar 1941. 6-Robert Sherborne Murray-Smith was born on 20 Oct 1865 in Victoria and died in 1886 in Oxford, Oxfordshire, England at age 21. 6-Mabel Murray-Smith was born on 20 Feb 1869 in Toorak, Victoria. Mabel married Frank I. Cox. They had two children: Murray Lockhart and Estelle Lockhart. 6-Estelle Murray-Smith was born on 16 Apr 1871 in Melbourne, Victoria and died in 1943 at age 72. Estelle married Charles Sibald Currie. Charles was born in 1866 and died in 1904 at age 38. They had two children: Estelle Margaret and Nora Mabel Sibald. 7-Estelle Margaret Currie. Estelle married Charles Denham, son of Unknown and Unknown. They had three children: John, Jane and Judith. 8-John Denham was born in 1929. 7-Nora Mabel Sibald Currie. Nora married Cecil Martin Kepple-Palmer on 30 Nov 1925 in Chapel of Bishops Court, Melbourne, Victoria. Cecil was born on 9 Apr 1897 in Haverfordwest, St Mary, Pembrokshire, Wales and died in 1973 in Bullingdon, Oxfordshire, England at age 76. They had four children: David, Angela, Thomas and James. 8-David Kepple-Palmer was born in 1931. 8-Angela Kepple-Palmer was born in 1933. 8-Thomas Kepple-Palmer was born in 1936. 8-James Kepple-Palmer was born in 1936. 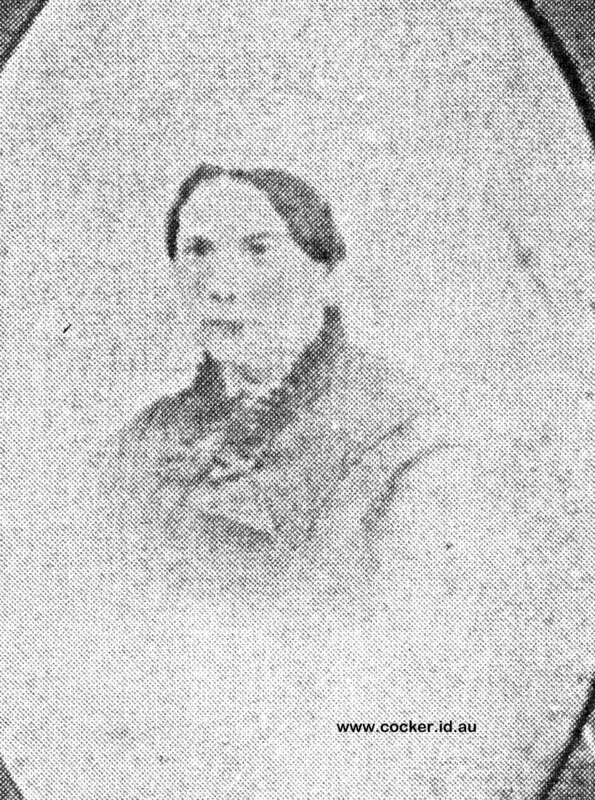 Isabella Smith Strachan was born in 1840 in Hobart Town, Van Diemen's Land, was christened on 29 Mar 1841 in St. Andrew's Church, Hobart, and died in 1862 at age 22. Isabella married Robert Rede. They had one son: Robert. Anne Strachan was born on 7 Apr 1843 in Hobart Town, Van Diemen's Land and was christened on 25 May 1843 in St. Andrew's Church, Hobart. Anne married Charles Parbury, son of Frederick Parbury and Elizabeth Ann Robinson. Charles was born on 15 Feb 1834 and died in 1915 in London, England at age 81. They had nine children: Lillias, Harold, Linda, Honora, Estelle, Claude, Colin, Keith and Hugh Ford. Lillias Elizabeth Strachan was born in 1845 in Hobart Town, Van Diemen's Land, was christened on 22 Sep 1845 in St. Andrew's Church, Hobart, died in 1861 in Geelong, Victoria at age 16, and was buried in Geelong, Victoria. Emily Agnes Strachan was born on 17 Jul 1847 in Geelong, Victoria and died in 1907 in Geelong, Victoria at age 60. Emily married Charles Shannon in Geelong, Victoria. Charles was born in 1841 in Greenock, Renfrewshure, Scotland and died in 1922 in Geelong, Victoria at age 81. They had eight children: Emily Strachan, Charles Hector, Archibald Norman, Herbert Strachan, Elliot Strachan, James Ford, Margaret Lillias and Dorothy Strachan. 6-Emily Strachan Shannon was born in 1875 in Geelong, Victoria and died in 1938 in Geelong, Victoria at age 63. 6-Charles Hector Shannon was born in 1877 in Geelong, Victoria and died in 1891 in Kew, Victoria at age 14. 6-Archibald Norman Shannon was born in 1878 in Geelong, Victoria and died in 1946 in Geelong, Victoria at age 68. 'By the death on September 15 of Archibald Norman Shannon, a member of the committee of the OGCA, the College has lost one of its most faithful friends, a worthy member of a family prominent in its annals. A large number of Old Boys joined the funeral cortege to the Eastern Cemetery to pay homage to one whose passing will leave a gap in the affections of hundreds of others who could not be present, for among Collegians Archie was always a popular and striking figure. Sometimes, indeed, from shyness or natural modesty, Archie hid his gentle, generous nature behind a careless attitude or a gruff reply. Those who knew him were not deceived, for they understood his genuine loyalty, his intolerance of humbug, his energetic application to what he considered important. And occasionally his good actions done by stealth were found out by accident, though no one will ever assess the total of his anonymous gifts to public causes or his secret help to the needy. A son of the late Mr. Charles Shannon (Chairman of the College Council 1908-22), Archie was at school from 1883 to 1893 and then for many years carried on pastoral pursuits in various parts of the country. He later settled down in Geelong, where he was associated with Godfrey Hirst and Co.—for ten years as a director. He was an active worker for St. George's Presbyterian Church, and for the Try Boys' Brigade, which was founded by his father. Early in the war he threw himself into A.R.P. work and the organization of salvage of waste products. He was an enthusiastic patron of amateur sport, football, cricket, but especially rowing; so it was natural that the College boat club should benefit from his coaching of juniors, his exert repair work and his eagerness to help crews organize holiday outings; the practice eight "A N Shannon" is a reminder of his practical generosity. In Archie's will the College takes a prominent place. Direct gifts include £50 to the boat club, books and a beautiful chiming grandfather clock to the Morrison Memorial Library, and a clock to the Preparatory School. Income from the bulk of the estate of over £30,000 goes to members of the Shannon family for life, after which two-fifths of the residue will go to the College.' His brothers James Ford; Elliott Strachan; and Herbert Strachan Shannon all attended the School. 6-Herbert Strachan Shannon was born in 1880 in Geelong, Victoria. Herbert married Alma Chinery. They had two children: Charles Strachan and Margaret. 7-Charles Strachan Shannon was born in 1914. 7-Margaret Shannon was born in 1923 and died in 1928 at age 5. 6-Elliot Strachan Shannon was born in 1882 in Victoria and died in 1914 in Terang, Victoria at age 32. Elliot married Agnes Maud Blakeby in 1914 in Victoria. 6-James Ford Shannon was born in 1884 in Geelong, Victoria and died in 1938 in Prahran, Victoria at age 54. James married Emily Millicent Rutledge, daughter of Thomas Rutledge and Edith Ritchie, in 1911 in Warrnambool, Victoria. Emily was born in Victoria and died in Victoria. They had four children: Neil Strachan, David Elliot, Geoffrey Ford and James. 7-Neil Strachan Shannon was born in 1911 in Geelong, Victoria. 7-David Elliot Shannon was born in 1916 in Geelong, Victoria. 7-Geoffrey Ford Shannon was born in 1919 in Geelong, Victoria and died in 1934 at age 15. 7-James Shannon was born in 1919 in Geelong, Victoria and died in 1919 in Geelong, Victoria. 6-Margaret Lillias Shannon was born in 1886 in Geelong, Victoria and died in 1958 in Sorrento, Victoria at age 72. 6-Dorothy Strachan Shannon was born in 1888 in Geelong, Victoria and died in 1973 in Canterbury, Victoria at age 85. James Ford Strachan was born on 19 Apr 1849 in Geelong, Victoria and died in 1925 in Saint Kilda, Victoria at age 76. In 1870 James Ford Strachan was one of the first Australians to row for Cambridge University in England. James married Harriet Elizabeth Chapman in 1873 in Geelong, Victoria. Harriet was born about 1847 in Skipton, Victoria and died in 1887 in Melbourne, Victoria at age 40. James next married Isabella Marion Stenhouse Aitken in 1873. Isabella was born in Skipton, Victoria and died on 7 May 1934 in Melbourne, Victoria. They had two children: James Ford and Geoffrey Lewis. 6-James Ford Strachan was born in 1893. James married Rona Macleod. They had one son: James Ford. 7-James Ford Strachan was born in 1925. James married Patricia Phillips. They had three children: James Ford, Phillip David and Georgina. 8-James Ford Strachan was born in 1949. 8-Phillip David Strachan was born in 1960. 6-Geoffrey Lewis Strachan was born in 1894. Geoffrey married Gladys Kettlewell. They had two children: Hugh Murray George and Susan Mary. 7-Hugh Murray George Strachan was born in 1930. Hugh married Shona Macintyre in 1962. They had one daughter: Jennifer. 8-Jennifer Strachan was born in 1964. 7-Susan Mary Strachan. Susan married John Raymond Patterson. They had two children: John Hunter and Geoffrey Harvey. 8-John Hunter Patterson was born in 1962. 8-Geoffrey Harvey Patterson was born in 1968. Hugh Murray Strachan was born on 5 Feb 1851 in Geelong, Victoria and died on 17 Dec 1933 in Toorak, Victoria at age 82. George wasa wool broker and company director. He worked briefly as a clerk for Turnbull Smith & Co., before spending a year in Western Victoria, and then two years in Eirope. In 1874, in partnership with J. and L. Howatson, he purchased 'Boondarra Station' on the Lachlan River in New South Wales. In 1875 he took over the firm of Strachan & Co. and merged it with the firm of John Wilson & Co. He also became a partner in John Sanderson & Co In 1882 he sold his pastoral holdings and invested in the sugar indusrty in Mackay, Queensland, but by 1888 he had lost all. He also held the 'Acheron Run' (near Alexandra, Victoria) from 1882 onwards (with William Murray). Hugh married Elizabeth Campbell Shannon, daughter of Archibald Shannon and Margaret Wilson, on 3 Feb 1876 in Hamden, Victoria. Elizabeth was born about 1846 in England. They had two children: Lillias Eleanor and Margaret Rhoda. 6-Lillias Eleanor Strachan was born in 1877 in Geelong, Victoria and died in Armadale, Victoria. 6-Margaret Rhoda Strachan was born in 1879 in Hawthorn, Victoria. Robert Norman Strachan was born on 24 Apr 1853 in Geelong, Victoria and died on 19 Aug 1927 in Armadale, Victoria at age 74. Robert married his first cousin Edith Anne Stodart, daughter of Dr. David Edmund Stodart and Margaret Stewart Murray, in 1891 in Geelong, Victoria. Edith was born in 1854 in Colac, Victoria and died in 1937 in Toorak, Victoria at age 83. They had one son: Lancelot Norman. 6-Lancelot Norman Strachan was born in 1892 in Armadale, Victoria and died in 1922 in Geelong, Victoria at age 30. Lancelot married Ruby Galbraith Stewart, daughter of Gordon Stewart and Isabella Galbraith, in 1919 in Victoria. Ruby was born on 28 May 1915 and died in 1965 in Malvern, Victoria at age 50. They had two children: Gordon Murray and Hilary. 7-Gordon Murray Strachan was born in 1920. He served in Word War 2 and died in 1945 as a prisoner of war at age 25. 7-Hilary Strachan. Hilary married S. N. Hiort. They had one son: Charles Malcolm.